This 3000 square feet (280 m2) Villa is located in a gated Community in Eastern Shores near Miami Beach. This is a Legal Short Term Rental Villa (City & State Licences). 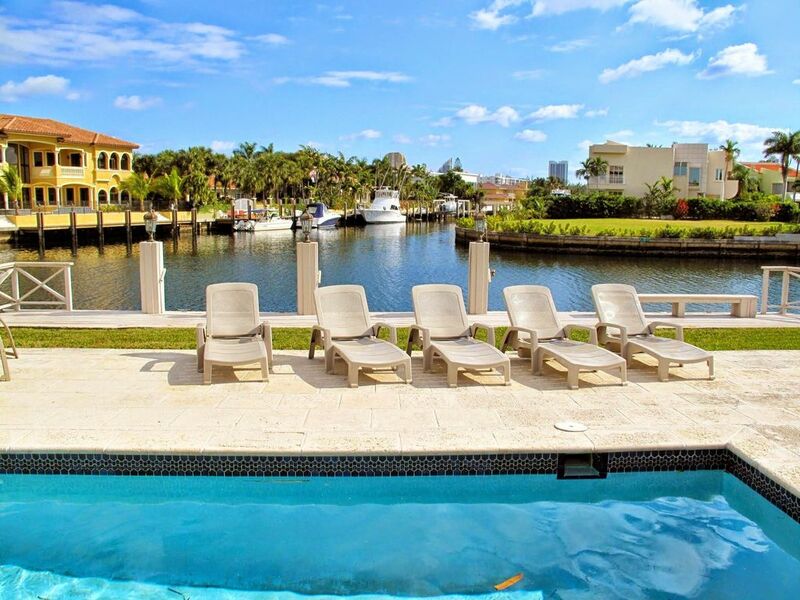 The Miami Vacation Rentals Villa has 4 bedrooms, 3 bathrooms, a heated pool and a boat dock (140 feet). It is a very welcoming place, with a warm orange color on the facade and a gorgeous front yard. When you open the front door, you will be amazed by the size & brightness of the living room with its comfortable sofas. Through the sliding doors, you can admire the magnificent view on the bay and the pool. The living room features 3 sofas (2 leather sofas), it is open to the dining room and offers a direct access to the terrace and the pool. From the dining room, you can access the fully-equipped kitchen (fridge, freezer, dishwasher, coffee, microwave, electric cooktop, oven and toaster), which offers you a nice bay view. From this bright kitchen, you have access to the terrace and the heated pool. The large terrace, with palm tree and other tropical vegetation, features a barbecue, a large heated pool, chairs, tables, and a lot of lounge chairs to enjoy the sun and the nice atmosphere of this villa in Miami Beach. The large master bedroom, with great clarity features a King size bed, a 27-inch TV, satinwood furniture, a large walk-in closet, and a beautiful bathroom (with shower). In this bedroom you have a magnificent bay view and a direct access to the pool. The second and third bedroom have a Queen Bed, a walk-in closet, and a TV with nice furniture, one of them has a sofa. Both rooms share a bathroom (with bathtub). The fourth bedroom has a Queen size bed, a bathroom (with shower), a large walk-in closet and offers a beautiful bay view and a direct access to the to the pool. This house is handicap friendly. You can access from the front door, the back door to access to the pool and backyard, the master bedroom, the master bathroom, ... and everywhere else in the house. This vacation home is fully furnished & completely equipped with linens and towels for your convenience. Aventura Mall is anchored by Nordstrom, Bloomingdale's, Macy's, Macy's Men Home Furniture, JCPenney and Sears, and offers South Florida visitors a compelling selection of international and national retailers including Abercrombie & Fitch, Boss Hugo Boss, Coach, Diesel. There are over 2.1 million square feet of shopping and entertainment at Sawgrass Mills. Sawgrass Mills is conveniently located at the crossroads of West Sunrise Blvd. and Flamingo Road just 15 miles from the Fort Lauderdale International Airport and 30 miles from the Miami International Airport. Miami Vacation Rentals. US is a family business managed by Guy Tenenbaum, his daughter Delphine and his son Olivier. All the properties we rent belongs to our Cie. If something wrong, we fix it right away, no need to ask anybody. We are sure that you will spend great Miami Vacation with us. Best regards FRAUD WARNING: Florida State and Miami Licensed Home. This Villa is a LEGAL SHORT TERM RENTAL with Florida and City Licences. NO RISK to be evicted by the POLICE. Never rent in Miami if the houses do not have Floida and City LICENCES for Short Term Rental or Vacation Rental. Don't take the risk to be evicted or fined by the Police by renting from an unscrupulous owner. By renting from a licensed company you reduce your risk of any fraud as well. Make sure you verify this information. On our webiste you will find all the links for all our Villa's Licenses advertised on VacationRentals. Be Aware that Vacation Rental is strictly prohibited in SOUTH BEACH. Miami Beach WITHOUT Florida Resort License. FRAUD WARNING: Florida State and Miami Licensed Home. This Villa is a LEGAL SHORT TERM RENTAL with Florida and City License. NO RISK to be evicted by the POLICE. Never rent in Miami if the houses do not have Florida and City LICENSES for Short Term Rental or Vacation Rental. Don't take the risk to be evicted or fined by the Police by renting from an unscrupulous owner. By renting from a licensed company you reduce your risk of any fraud as well. Make sure you verify this information. On our website you will find all the links for all our Villa's Licenses advertised on VacationRentals. Be Aware that Vacation Rental is strictly prohibited in SOUTH BEACH. Miami Beach WITHOUT Florida Resort License. - broken chairs on the deck - were replaced same day. - stove door fell off - repaired same day. - toilet leaked - repaired and replaced the same day. - dishwasher not secured and tilts when racks pulled out if full - not reported. - hot water in bedroom bathroom besides the kitchen is very intermittent. Hot water in other parts of the house cannot be used at the same time as that back bathroom otherwise NO HOT WATER in the back bathroom. - the house was very sparsely furnished. - there is no convenient access to the Atlantic beaches if you want parking. Everything was as stated in the description. A perfect location close to everything, yet private. The pool was amazing and the view was great! We would definitely recommend this house. Great location, the house not so much. First the good. The house was in a very nice location; in a private neighborhood close to the beach, restaurants, attractions and shopping. The layout of the house itself was good and the rooms and closets were large, and the outdoor pool area, with a grill, also was very nice. Managers were available and helpful. The condition of the house was the major downside: while it was very clean, it was clear that the home was not being kept up. Missing toilet roll holder in the Master Bath, sloppy paint jobs, sagging gutters, and cheap fixtures and furnishings throughout. Dishes, pots, pans etc. supplied were bottom of the line, as were all the appliances - excepting the washer and dryer. The home is in a residential neighborhood in which many of the properties have recently been extensively renovated or are undergoing renovation. This rental is also for sale, and one gets the unmistakable impression that the present owners are putting minimal money into it until it can be sold. My wife,sister and I had a great stay. Olivier was very helpful,I will reserve another stay next year. La maison est superbe er superbement place. On est Francais donc raleur mais on a pas eu l'occasion de se plaindre. Delphine est super sympa et a su nous donner toutes les bonnes adresses, restau, shopping etc. On a adore Merci.